Free ebook on how to select and buy an elite domain name. Covers Internet branding and trademarks. Offers Credit Time 2000 software used for submitting credit information to the major credit bureaus. Produces Credit Vision software which allows credit reporting agencies to process one, two or three bureau merged credit reports. Provides Internet-based solutions for credit reporting agencies. Provides businesses with a secure gateway to access consumer credit information via the Internet. Offers a means of customizing and configuring Microsoft Access for use as credit management and collections software. Provides Internet and Windows based Credit Decision and Merge Credit software utilizing XML, Java II and ActiveX technologies. Provides custom software to banks and mortgage brokers for the purpose of creating in-file, merged and mortgage credit reports. Software for automated processing of credit cards using the Merchant ID and bank. Turn the PC into a credit card processing terminal. Free 30-day trial. Offers information, FAQs, downloads updates, and user manual in pdf format. Softech Solutions specializes in credit related systems and software, including PaySys VisionPlus, for some of the worlds largest credit card processors. Credit reporting software for the automation of tenant screening, mortgage reporting, pre-employment screening. Access and merge all three credit bureaus. Develops and provides software solutions and services, including a software-based online network, for automating consumer and small business credit analysis, decisioning and funding processes. (Nasdaq: CMSS). If you are taking credit/debit cards, you will need a secure ordering option on your web site. Our secure server service offers a totally safe way for your clients to send their credit/debit card details. Offers software for deduction and credit management. Provides credit collection and deductions management software. Credit card and transaction processing applications. Produces CyberFinancial credit collection software. Provides a way to validate credit card numbers. By Donia Software. Windows based software for credit report retrieval. Registration without a credit card. Reseller and affiliate program available. A pay-per click search engine that offers free ppc credit to new subscribers. Provides debt consolidation and management software systems for credit counseling agencies. Offers credit and receivables software to used car dealers and loan specialists. Application for Windows systems only. Integrates with Cybercash for credit card acceptance. Offers software for POS, accounting, inventory control and credit card processing. Sells Creditbase software that allows businesses to access credit reports. Offers design, and credit card processing services. Services for credit unions, including web design, and website hosting. 10:7 exchange ratio plus 250 credit signup bonus. Earn credits from your referals. If the business hours of Domain Name eBook in may vary on holidays like Valentine’s Day, Washington’s Birthday, St. Patrick’s Day, Easter, Easter eve and Mother’s day. We display standard opening hours and price ranges in our profile site. 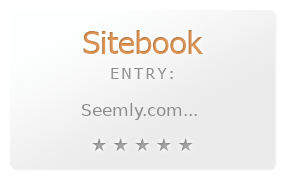 We recommend to check out seemly.com for further information. You can also search for Alternatives for seemly.com on our Review Site Sitebook.org All trademarks are the property of their respective owners. If we should delete this entry, please send us a short E-Mail.